Although yesterday (Memorial Day) was a mild and beautiful day here in Tucson, this morning there is considerable suspended dust hanging in the air. It was quite cool at sunrise, and the low temperature here at the house was 47F - so we'll probably have a diurnal range today of around 50F. There's not much to summarize for May. Precipitation here was a Trace, with the dominant weather being wind and dust during the month. Coolest morning was on the 1st with 34F; hottest days were the 27th and 28th with airport highs of 100F. 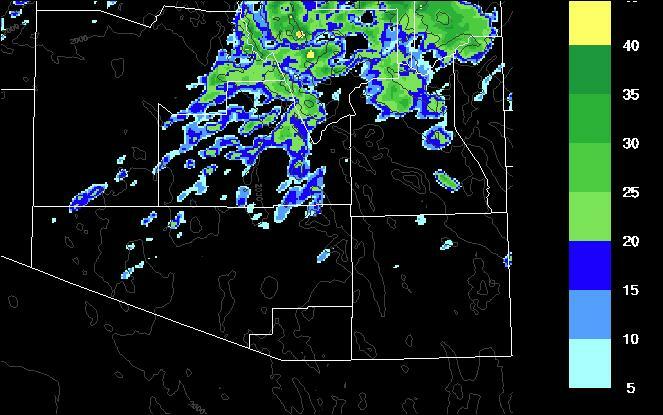 The only precipitation across southeast Arizona occurred at the highest elevations and was light. PHOENIX RADAR BACK IN OPERATION! The NWS radar at Phoenix (KIWA) is operating again, so I assume that the upgrade to dual-polarization has been completed. Looks like there are a few bugs to work out - the radar this morning appears to have gone into precipitation mode due to unfiltered ground clutter. The area out south of Wickenburg is notorious for rock rain (what I term ground clutter that is strong enough to accumulate false rainfall amounts). There should be an enhanced suite of products becoming available, and hopefully details will be posted shortly. The view this afternoon south from Kitt Peak, as 30 to 50+ mph winds prevail across southeastern Arizona. An ugly, dangerous situation, if wildfires errupt anywhere. Also more itchy eyes and sneezes - definitely has not been a pleasant allergy season down here. It hit 100F for the high yesterday (Friday May 27th) here in Tucson, so from now until September we'll be tracking consecutive days over 100F. The image above is from Kitt Peak this morning, looking south into the cloudless skies of northern Mexico. The Mexican Plateau has really heated up and 700 mb temperatures are very hot - see map below (700 mb 12 UTC plot from NCAR RAP with my analysis of isotherms). Note the large area of Mexico and the U.S. southern Plains with 700 mb temperatures over 14C - this entire region thus has 700 mb potential temperatures (theta) of 45C or higher! Quite an impressive slug of hot air. As the 500 mb trough deepens along the west coast, the hot air will be advected northeastward across much of the central and eastern U.S. This morning's NWS NAM forecast for next Tuesday afternoon forecasts 500 mb heights of 5940 m or higher from central Texas to Kentucky. Looking south to lower latitudes, we find that currently the air mass along the Pacific coast of Mexico is very dry. The blended PW chart for the eastern Pacific this morning indicates that PW of 50 mm or greater remains off to the southeast of Cabo Correntes, with values around 30 mm just reaching north to around latitude 20 N.
Convection over Mexico yesterday (west of 100 degrees W longitude) remained over the high terrain of Durango and Zacatecas - see visible satellite image below for 2200 UTC. Hope everyone has a great 3-day weekend. 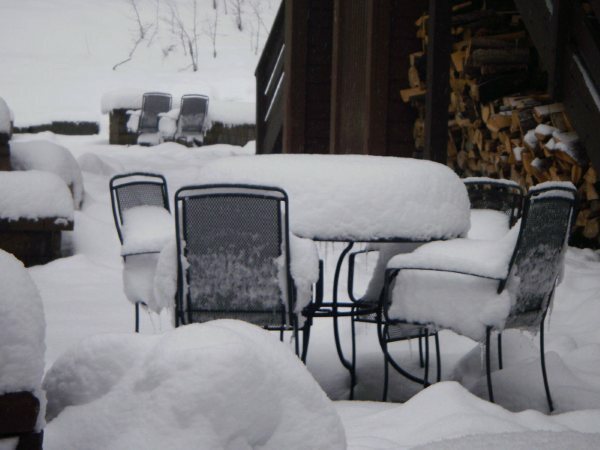 Stoke up those grills and help build that summer-like ridge over the country! 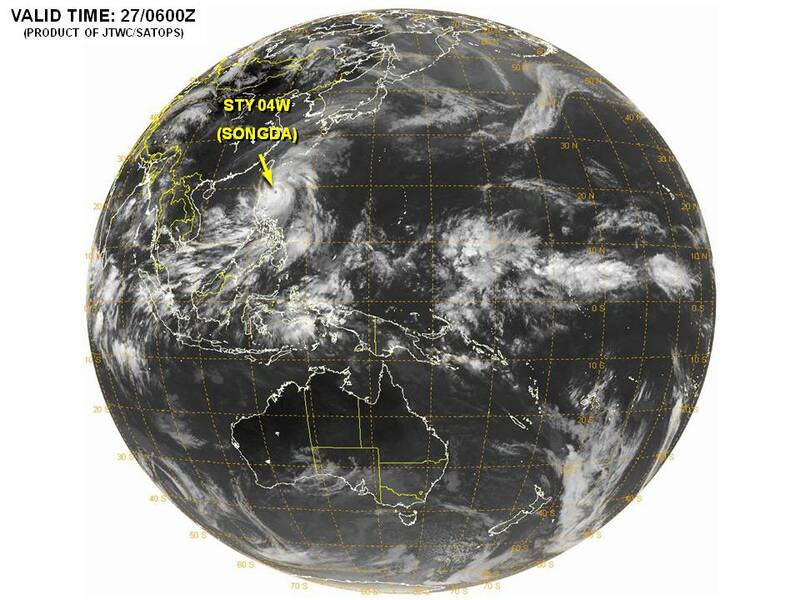 Super Typhoon Songda (aka 04W) has skirted by the Phillipines, passing off to the northeast of Manila. This storm will morph into a strong extratopical cyclone in the north Pacific by mid-week next week, and may play a role in the ridge building forecast over Alaska and the Arctic - perhaps a bit of a wild card wrt the long-range, global forecast models. 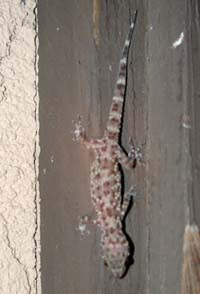 Back here in Tucson, the official high hit 99F yesterday (Thursday May 26th). I have been hoping to make it until June before having to switch the heating systems over to cooling mode for the summer. 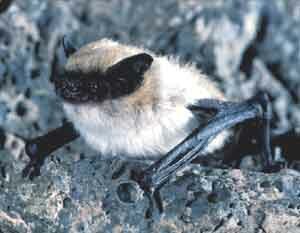 However, the adobe, and its thermal inertia, may force me into action today or tomorrow. The very nice, cool mornings this week have helped me delay the switch - lows here at house have been in the upper-40s several mornings and yesterday's low was 50F - thus a 49F, or so, diurnal swing. Interesting Long-Range Progs - Summer On Horizon? Shown above are the operational GFS and ECMWF 500 mb forecasts for 168 hours from 12 UTC this morning (Thursday May 26th). Both models forecast a deep trough off the west coast and build a strong anticyclone over the East and Southwest. The models also retrogress this pattern westward during the last few days of the forecast period. Certainly a summer-like pattern, with 500 mb heights forecast to be above 5880 m over much of the country. Below are the models' forecasts at 240 hours (I rarely look this far out, but...). The ECMWF continues to retrogress the pattern westward; whereas the GFS forecasts the trough to move onshore over the western US. Both models hint that some meager moisture may advect northward from Mexico into the Southwest - so there may be a threat of high-based, mostly dry, thunderstorms as June begins. This would pose a serious threat for more wildfires, given the tinder-box dry conditions over much of New Mexico and southeastern Arizona. Andrew Revkin, who usually blogs on climate issues, has been drawn in by the severe thunderstorms and tornado outbreaks. Below are excerpts from an early May post - today he addresses SPC products and yesterday's outbreak at his blog. It’s fine for Kevin Trenberth of the National Center for Atmospheric Research to say he feels “it is irresponsible not to mention climate change” when discussing tornado outbreaks. Everyone’s entitled to his or her view. That problem, the experts said yesterday in a statement, is an ongoing “lemming-like march to the sea” in the form of unabated coastal development in vulnerable places, and in the lack of changes in government policies and corporate and individual behavior that are driving the trend. Yet another tragedy occurred yesterday with serious death and destruction impacting the citizens of Joplin, Missouri, from a large tornado. 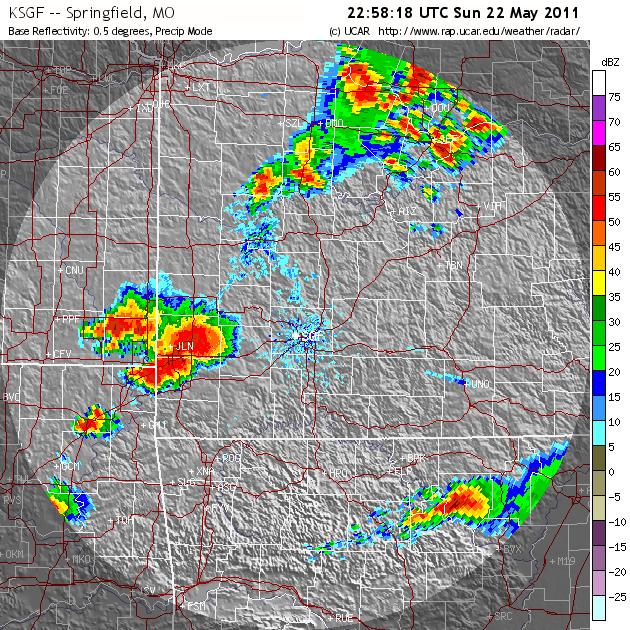 The above images show radar reflectivity and IR satellite imagery from NCAR RAP shortly after the tornado struck Joplin ( a medium-sized city in southwest Missouri just north of I-44). High resolution radar (with a couple of my editorial additions) is shown below from weather.com. The high-resolution radar image below shows the destructive tornado which moved through Joplin, Mo. It shows a well-defined hook echo with the lavender tornado debris ball (circled area on left image) at the base of the hook. A debris ball is the radar seeing actual debris suspended in the air by the tornado. 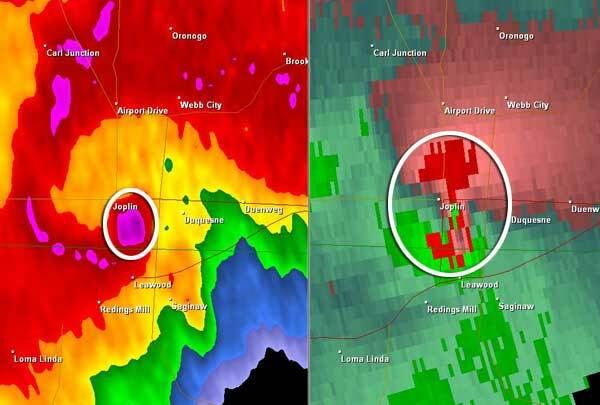 According to Dr. [Greg] Forbes, the lavender debris signature, which marks the tornado, is just over a mile wide and extends with a tilt toward the north upward to about 18,000 feet. This indicates that substantial debris was being tossed [i.e., carried aloft by the tornado circulation and the mesocyclone's updraft] at least that high. The National Weather Service in Phoenix is pleased to announce that the much-anticipated installation process of the Dual-Polarization Radar upgrade to the KIWA WSR-88D, located at Phoenix-Mesa Gateway Airport, will occur during the next two weeks, between May 17th and approximately May 25th. 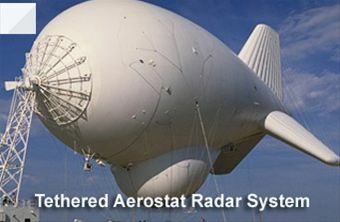 The KIWA radar will be one of the first in the nation to receive this upgrade, with all WSR-88Ds to be upgraded through 2011-2012. This important technology will greatly expand the amount of data types and radar products available to users. It is important to note that during the entire time of installation, the radar will be offline, beginning Tuesday May 17th. Nearby radars (Yuma, Tucson, Flagstaff, and Phoenix TDWR) will provide continued coverage during the upgrade. On-line Dual-Pol Training Available!. The third week of May ended here with two very nice and cool mornings - low temperatures at house were 43F yesterday and 46F today (Saturday May 21st). Nothing like where my son, Jason, lives - north of Durango, Colorado, near Purgatory Ski Area. He took the shot below on the condo deck as he headed to work yesterday morning. 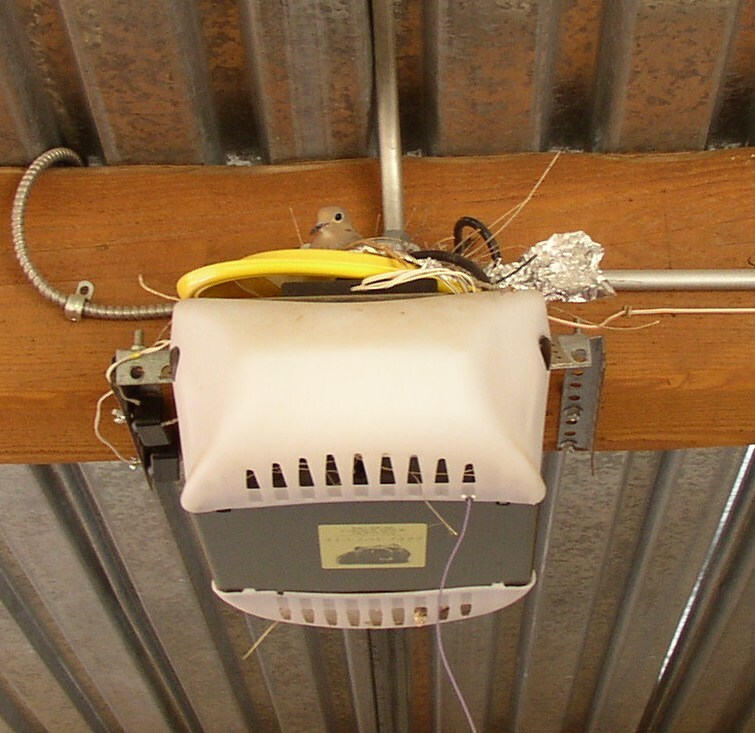 Each spring we have a battle with the doves that want to nest in our car port on top of the garage door motor. Thought I'd won this year with slick, plastic plate and aluminum foil stuffed up there. But a couple of mornings ago I glanced up and there was a Mourning Dove nested in there. Can just see her in photo below. 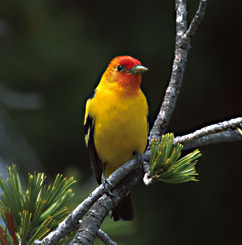 Finally, while walking along the Rillito Wash at sunrise today I saw a Western Tanager (see below) perched in a small tree along the path. First time I recall seeing one here in the city. Very colorful in contrast to the ubiquitous doves. Once again, the Atmo high-resolution version of the WRF model provided quite accurate forecasts for the event of yesterday afternoon and last night (see below). As the model predicted, rainfall was limited to the Catalina mountains in the Tucson area. 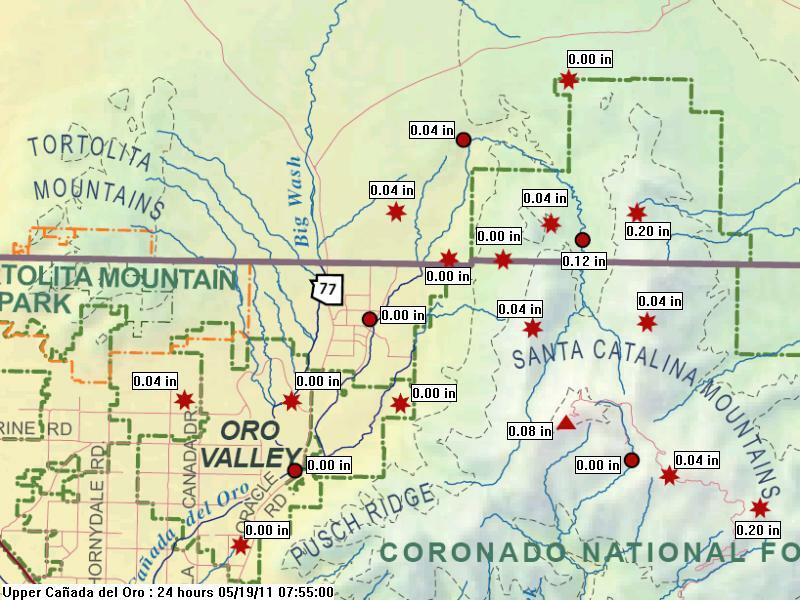 ALERT map above shows the Catalina sites that measured light rainfall during past 24-hours - 10 sites with all amounts under a quarter of an inch. Gauges across the metro area recorded no rainfall, nor did any of the rest of the gauges in the ALERT network - so, as the model sadly indicated, zero POPs over most of region. Here at the house we had the briefest and slightest spit of rain just before 6:30 pm - just enough to add a brief smell of rain to the air. off to the northeast, the RAWS station on Mt. Graham had light rain, as did three RAWS sites off to the northeast of Mt. Graham. So, mostly stymied again across southeast Arizona! The above is from the Albany SUNY weather page and shows surface theta (in degrees C) over the Southwest. Note the distinct cT air mass over much of New Mexico and west Texas. This continental air is being pulled into the deep surface cyclone over southeast Colorado. The theta plot also nicely indicates the Pacific front from southwest Colorado across western New Mexico to southeast Arizona. Wind And Dust Today - Sprinkle Of Rain? Strong 500 mb cutoff over Oregon this morning (Wednesday May 18th) with main short-wave trough extending south aross California. Strongest vorticity maxima currently over southern Nevada and northern California coast, with vorticity tail extending north to Alaska. System most strongly impacts northern Arizona as it shifts eastward, with the vorticity tail strengthening and shifting southward to southern Arizona by Friday. Looks like windy and dusty conditions today, with pollen blowing around making for bad allergy conditions. Paper this morning mentions 30% chance of rain tonight for the metro area, but this may be optimistic. Top graphic above is from the U of A Atmo WRF-GFS forecast run at midnight. 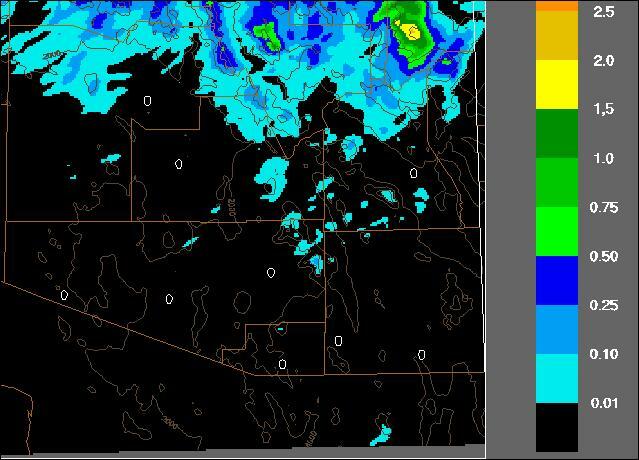 Shown is composite radar reflectivity forecast for 6 pm this evening - this is about the maximum activity the model forecasts for southeast Arizona. Middle graphic is WRF-GFS forecast of total precipitation through noon tomorrow. With some slight amounts at higher elevations and to the north, the WRF forecasts zip for Tucson metro area. This morning's NAM (bottom), with its coarser resolution, smears some light precipitation into lower elevations - shown is total forecast precipitation through noon tomorrow. The only hopeful signs I see for showers are 1) there seems to be quite a bit of cloud and moisture spilling over the coastal ranges in northern Baja and southern California, and 2) the blended PW product for the eastern Pacific at 1200 UTC this morning (see graphic below) shows a very nice plume of higher PW coming into the Southwest. So we'll wait to see what this evening actually brings. Last Tuesday morning's run of the U of A, WRF-GFS model at midnight indicated a band of light showers would move across the Tucson area around 3 pm (top image). Here at the house we actually had a slight sprinkle, and thus a trace of rain, around 2 pm as virga and light showers had developed, much as forecast by the model. Radar at 2 pm is shown just above, indicating that the WRF forecast was quite good for this very marginal weather event. The model appears to have over-forecast precipitation to the north at higher elevations. 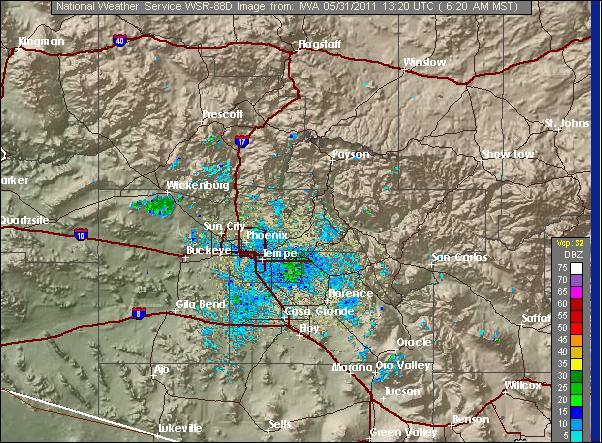 The radar echoes over southwest Arizona are from chaff releases above the DoD ranges out there. 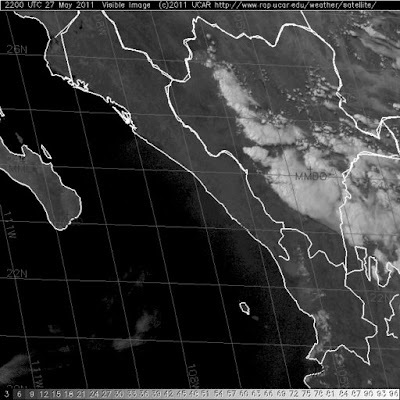 The MCS (discussed in the previous post) developed rapidly after about 0830 UTC during the morning of May 12th. Top image above shows regional radar reflectivity at 03 UTC, which indicates the storms had quickly become very intense. The 08 UTC surface plot (just above) indicates that deep, moist and apparently very unstable, low-level air was advancing to the northwest just behind a narrow dry sector that was also retreating to the northwest. 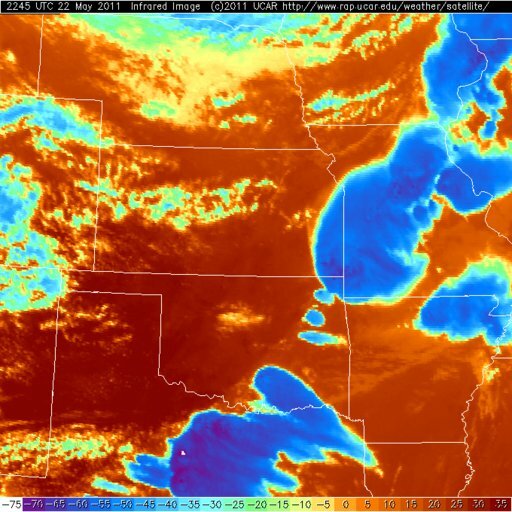 A weak, middle-level short-wave trough was swinging around the southern periphery of the cutoff cyclone over west Kansas. So, several interesting features were in play, even though the event was developing during the early morning hours before sunrise. The most interesting aspect of this event is that model forecasts did not accurately forecast the delopment of these storms. 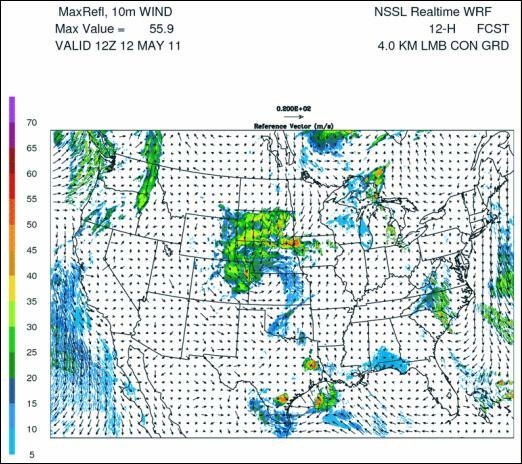 The NSSL 12-hour, 4-km WRF forecast valid at 1200 UTC on the 12th (immediately below) indicated a small, intense cluster of storms near Corpus Christi, Texas. 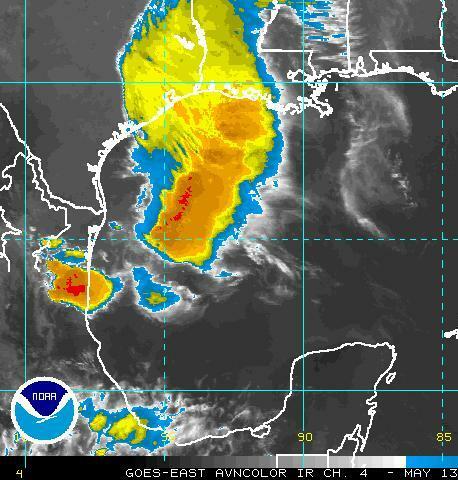 The 12-hour operational NAM model (bottom image) forecast an arc of storms at 1200 UTC over Galveston, Texas, extending southward into the Gulf of Mexico. Thus, the human forecaster still faces, even in this age of markedly improved forecast models, at times surprising and perhaps totally unexpected significant weather developments. The blog has been down - wrt to new posts - for about a day and a half and has just come back to life this morning - Friday the 13th! So, I've got a couple of posts that have been malingering. 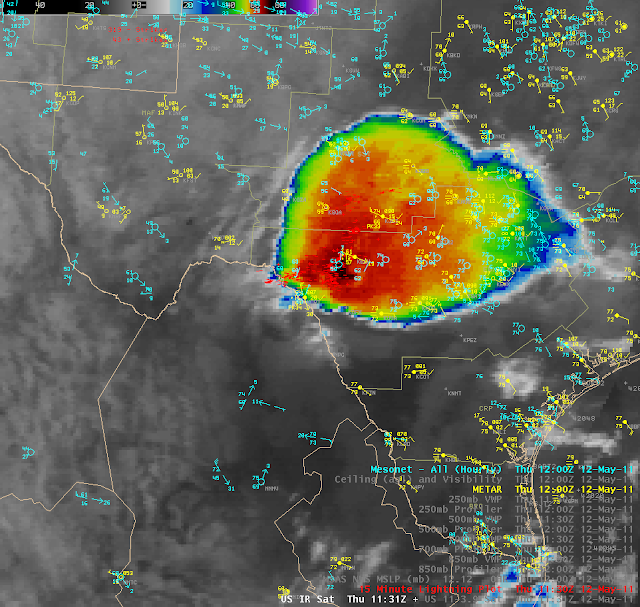 Mike Hardiman alerted me to the MCS that developed around 3 am yesterday morning (Thursday 12 May 2011) northwest of Del Rio, Texas. Mike sent along the top image, which shows IR satellite imagery with surface plot and lightning strikes at about 1130 UTC on the 13th. The second image shows nearly concurrent radar image from Del Rio. The bottom two IR images show the system progressing eastward at 2130 UTC and 0215 UTC on the 14th. Very nice MCS that initiated at an unusual time of the morning. 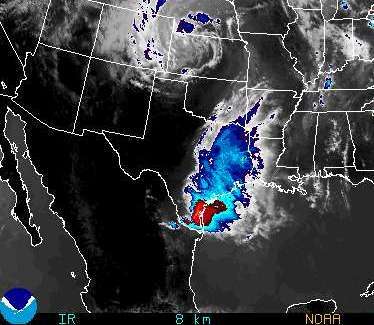 It produced some severe storms across south Texas before it headed out to sea. Will examine the model forecasts next. Mike Hardiman asked: Hey Bob, could you post a link to your source for those GPS-vs-Sounding plots you post occasionally (including this entry)? They will be very valuable in the summer. I've shown two examples of GPS comparisons with sounding PWs above - Tucson top showing the last 5 days with the soundings too dry and Corpus Christi bottom showing soundings too wet wrt GPS data. 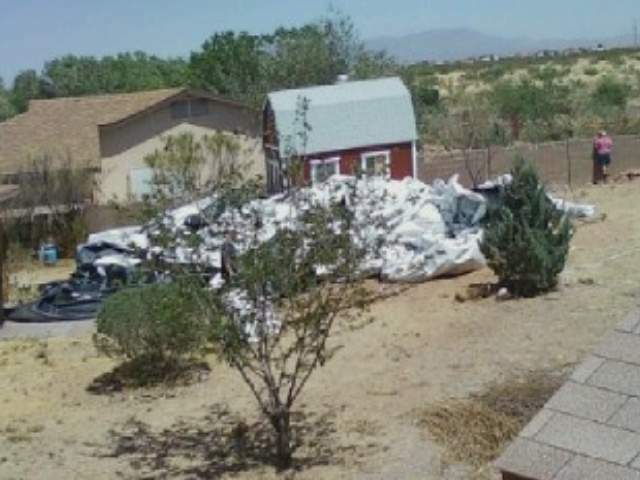 A Customs and Border Protection surveillance balloon went down during strong winds yesterday in the Sierra Vista/Ft/ Huachuca area. The balloon is usually tethered during high winds, so it's unclear exactly what went awry yesterday. Ft. Huachuca observed gusty winds of 30 to 47 mph through most of the day yesterday. The balloon carries a sophisticated Doppler radar, so it was a costly loss. The southern end of the 500 mb trough that's over the West will move eastward across southern Arizona today, as has been well-forecast by the models last several days. This morning's (Tuesday May 10th) NAM 500 mb forecast for 5 pm this afternoon is shown in the top image. At 5 pm the model forecasts a strong vorticity maximum to be nearly over Tucson. 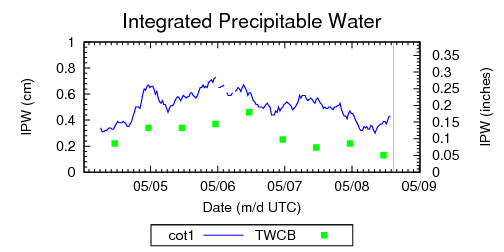 PW is about a cm, which is up some from earlier in the week but certainly quite limited. The midnight run of the Atmo WRF-GFS, high-resolution model (bottom image above) indicates weak, high-based convection moving across the Tucson area around 3 pm this afternoon. The image shows model-predicted, composite, radar reflectivity at 3 pm. 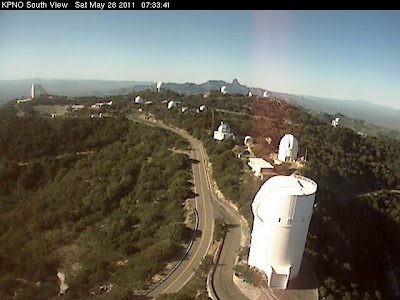 The view from the Kitt Peak webcam, looking north, is shown below - it is picking up a bit of a cu field out to the west. So, we will watch what transpires this afternoon. Would be nice to be rid of the dust and pollen for a couple of days. The Tucson sounding this morning (Sunday, May 8th - top) indicates a bone-dry atmosphere with only 1.2 mm of precipitable water (PW). However, when RH is very low the RRS sonde's humidty sensor tends to be too dry. This is illustrated at bottom where GPS PW is shown (blue) vs TWC sounding PWs (green squares), which have been consistenly too dry for past few days. This morning the GPS data indicate that there's almost 3 mm more PW than indicated by the sounding - so it is VERY dry, but not quite as dry as the sounding data indicate. The real amount of PW present in southeast Arizona will be an issue of interest from now all the way through the summer thunderstorm season. It's another hot and breezy afternoon here in Tucson - a bad allergy day also. Shown above at top: the NCAR RAP 500 mb analysis from 12 UTC May 7th. Note that 500 mb heights at Tucson were 5800 m this morning. The system that will dig slowly southward and impact the western US during the next 3 days was just off Vancouver Island this morning. As the system digs south, 500 mb heights will be falling, and today will be the last day where we flirt with 100F for a while. The middle chart is the 3 pm surface plot - again from NCAR RAP. 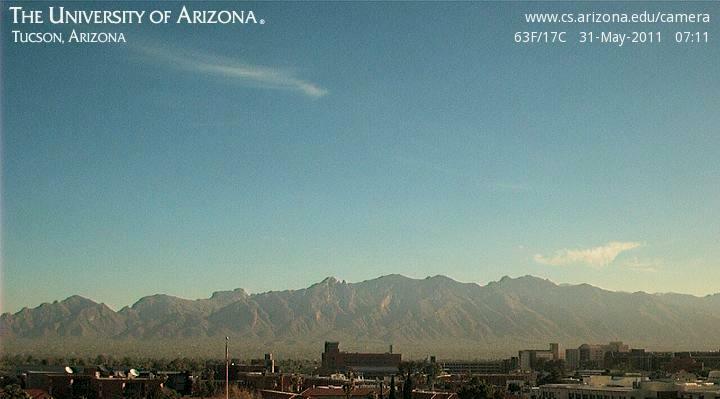 Tucson was at 96F with a -8F dewpoint and winds of 15 to 20 mph. There are a couple of 100F readings again out in the lower Colorado River area. Winds are considerably stronger over northern Arizona, the Mojave, and the Great Basin. Note the -14F dewpoint at Truth-or-Consequences, New Mexico. 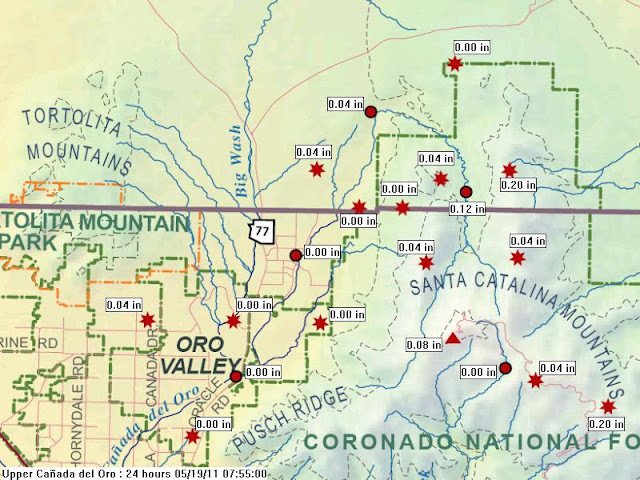 Depoints remain bonkers at FHU and CGZ in southeastern Arizona. Bottom image is current NAM 500 mb forecast for midnight Tuesday night. Note that 500 mb heights are forecast to drop to around 5640 m, down about 160 m. A strong vorticity maximum moves eastward across central and southern Arizona during the day Tuesday, but the model currently forecasts the strong dynamic forcing for vertical motion to work on very dry air - so what we can count on is more wind and dust and blowing pollen. Will watch to see if the system can manage to pull a bit of Pacific moisture into it before it exits to the east. It is a perfectly clear and dry day across Arizona as the drought continues, especially in the southeastern part of the state. Shown above are the 2 pm visible satellite image (top) at 2 pm MST (Friday May 6th) and the concurrent surface observation plot (bottom). Two things of interest on the surface plot - first, the ASOS dewpoint sensors are not functioning correctly at Casa Grande (CGZ) and Ft. Huachuca (FHU). The dewpoints are observed to be in the 30s, but these appear to be way too high. For example, the current dewpoint at the Carr RAWS station (which is a couple of miles south of FHU and at higher elevation in a forested location) currently reports a dewpot of 2F. Second, note the 100+F temperatures observed out along the Colorado River. Here in Tucson, at the airport, highs the last 2 days have been 96F and 95F, with today turning out to be quite similar. 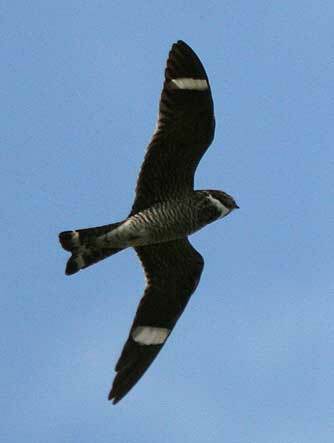 The common nighthawks and butterfly bats (western pipistelle) have returned two to three weeks earlier than usual this spring - they showed up hunting bugs in their erratic, evening flights during mid-April.